These sensors are traditionally used in plant growth studies. There are waterproof models suitable for long term exposure and underwater applications, and splashproof models of the PAR Quantum & PAR Energy suitable for glasshouses, plant growth cabinets, etc. The PAR Quantum is the sensor with the ideal 100% quantum efficiency curve and is traditionally used in plant growth studies. The spectral response has been well researched and documented and is widely accepted as ‘the standard'. The PAR Quantum has an output in micromols.m-2.s-1 and the PAR Energy in watts.m-2. The PAR ‘Special' has a response which has been tailored to match the light used by a typical green plant and gives an output in micromols.m-2.s-1. The Energy Sensor has an output in W/m2 which can easily be matched with other sensors that output in the same units, such as pyranometers. 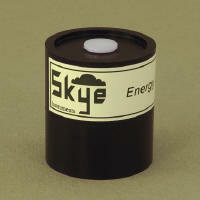 The Company started on the Isle of Skye, Scotland and re-located to Wales in 1986. In addition to their standard sensors, they are able to make custom sensors for specialised applications and growth chambers.